HealthEquity is strongly positioned in the HSA sector and has proven its ability to expand its user base. The HSA industry has a lot of visibility and is poised to grow exponentially in the coming years. Top line analysis shows the strengths in the business and also highlights the risks in the growth path. 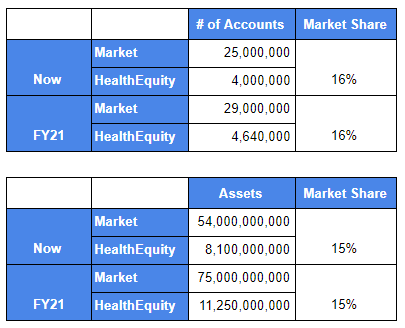 HealthEquity (HQY) is a HSA custodian that has 15% market share and manages $8.1 billion in HSA assets. HealthEquity has demonstrated increasing market share for eight consecutive years and has more than4 million HSA accounts and serves more than 45,000 employers. HealthEquity ranks second in total custodial assets and number of HSA accounts. Over the years, service revenue as a percentage of total revenues has dropped. We have seen an increase in custodial and transactional revenue. Devenir forecasts the existence of 29 million accounts by 2020 with $75 billion in assets under management. If we extrapolate the same market share of HealthEquity, we anticipate HealthEquity to manage approximately $11 billion in 2020-21 and have approximately 4.7 million accounts. Data Source for "FY21" is based on my projection for HealthEquity from Devenir market research. Only 4% of the accounts have an investment balance today. Wide range of investment options is a primary reason for a customer to choose HealthEquity as their HSA custodian (please refer to our section below on “why customers choose HealthEquity”). Hence, I believe it's fair to assume that a large number of account holders are interested in investing their HSA assets. Accounts above a threshold (determined by the agreements with the network provider) are allowed to invest the remaining balance in a range of mutual funds. For HealthEquity to be a good investment, I consider member base growth as a basic requirement. In order for it to be a strong growth story, there has to be more in the form of value-added services. For this, let us take a look at the individual segments. Accounts with balances greater than $2,500 do not incur monthly account maintenance fees. I anticipate the number of accounts that qualify for this waiver to increase over time. HealthEquity provides incentives to network partners by charging a lower rate for adding more HSA members. These initiatives will increase custodial revenue but reduce the service revenue per account. It isn’t great to see that a segment not having a bright future, but you can’t have your cake and eat it too. Reduced service costs and fees could contribute to increased user base. This satisfies more than my basic requirement of member growth. Hence, this segment is the backbone of HealthEquity’s growth story. 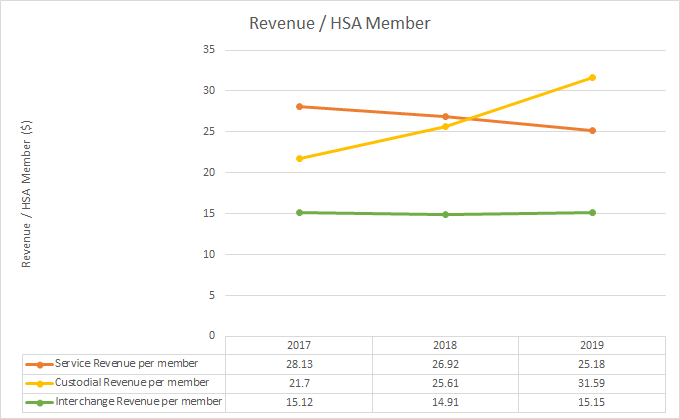 Interchange revenue per HSA member remains more or less constant over the past three years. The main driver for the growth in this segment is the increased member base. 77% of HealthEquity’s member base constitutes spenders per the company’s FY19 annual report. Growing number of spenders is, in theory, good for HealthEquity’s interchange revenue. This therefore could be fulfilling more than the basic requirement in the investment thesis. However, I see long-term concerns in this segment. Please see risk No. 1 below for more details. 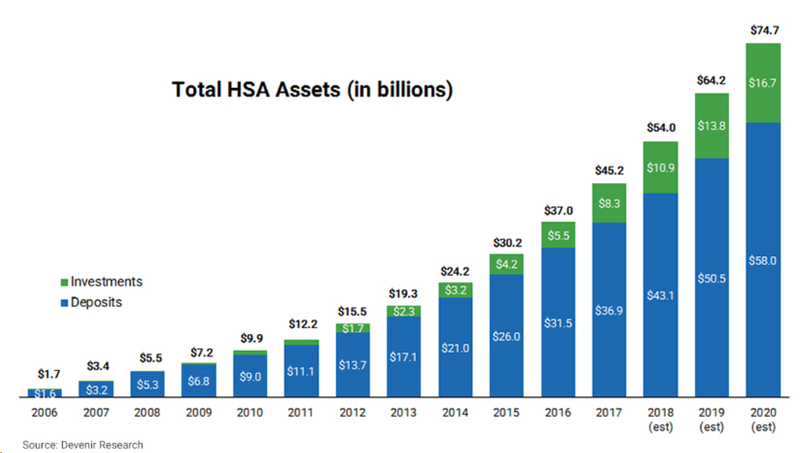 Increasing account balance: A growing number of employers are contributing to employee HSA accounts as part of the benefits offerings. With increased focus in the sector, I feel it's fair to assume that the average account balance will continue to increase in the future. This will in turn result in higher custodial revenue. Increasing market share: The projections above assumed a constant market share. However, HealthEquity’s capable management has demonstrated that its core strength is in expansion and growth and we can feel confident that HealthEquity will continue to increase its market share in the future. Reducing number of unfunded accounts: The Devenir 2018 report says that less HSAs (15%) were unfunded at the midway point of 2018 compared to 20% at the same time in 2017. With greater awareness about the benefits of HSA, we can expect this trend to continue. Increased eligibility for HSAs: President Trump’s healthcare budget has the potential to expand the tax advantaged savings accounts to Medicare beneficiaries. This is a segment of the population previously unavailable to HealthEquity. In November 2018, HealthEquity released information about a data breach that affected 165,800 individuals. They reported this to have occurred due to unauthorized access of the email accounts of two employees. This is the second breach disclosure from HealthEquity in 2018 after a smaller incident affecting approximately 16,000 users took place in June 2018. The management has revealed that they have begun programs in cyber security to increase awareness among their employees in order to reduce their vulnerability to social engineering techniques. Be open and sincere. Admit if the fault was on company's side and accept responsibility. Provide details. Explain why the situation took place. Mitigate. Make conclusions out of the disaster and describe solutions for affected users. If possible, prepare a special offer for the affected audience. Educate. Explain how to prevent similar issues in the future. These guidelines not only help minimize the negative image of the company but also instill confidence among consumers that the organization is a reliable and transparent partner. Based on the steps taken by HealthEquity post the incident, I feel the team did well in socializing the details associated with the incident and in making their commitment to protect affected users as well as prevent the occurrence of such incidents in the future. In the Q4 conference call, management announced plans to spend ~$30 million on improving the technology infrastructure and for increased security of the platform. While this announcement creates short-term concerns of a reduced bottom line, it's consistent with past trends. Strong data security posture is an essential requirement of any organization in today’s era of interconnectivity. I believe the investment in increased security and enhanced infrastructure is a strong move by HealthEquity to support a much larger user base in the future. Why customers choose HealthEquity among other HSA custodians? HealthEquity has consistently been ranked among the top custodians for an HSA. Recently, Investors Business Daily ranked HealthEquity as the best HSA custodian for 2019 based on fees, features and investment options. HealthEquity is well rated by MorningStar over the years for having plethora of investment options in the form of mutual funds. Reduced Interchange Revenue: This segment of the business relies on customers using their HealthEquity debit card. Several reports claim that debit card use has fallen in recent years. Millennials prefer using credit cards for added security and benefits like cash back, miles, and other perks. Interchange revenue constitutes 21% of the top line for HealthEquity in FY19. HealthEquity has a very customer friendly mobile app which makes it out of pocket reimbursement requests easy. This convenience may potentially be a threat to the top line for HealthEquity. Spending vs Investing: HealthEquity’s reports show that a major percentage of account holders are “active spenders” or “confident consumers.” Reports show that 96% of HSA funds are spent annually. If this trend continues, HealthEquity may not see any growth in investment revenue. Though increased spending by consumers is surely good for the interchange revenue, if combined with risk No. 1, it could be a threat for top line growth of HealthEquity in the form of reduced custodial and interchange revenue. Cyber Security: Healthcare is a highly targeted sector for cyber attacks. Healthcare records have the highest value per record compared to any other industry. HealthEquity has experienced data breaches in the past. As an organization governed by healthcare and financial regulations, HealthEquity could face huge penalties if the magnitude of these breaches increases. Moreover, increased occurrence of cyber incidents could reduce customer confidence in the platform thereby directly affecting the top line for HealthEquity. Interest Rates: A custodian of financial assets is subject to the risk of falling interest rates. HealthEquity’s custodial revenue could be impacted by reduced interest rates. Unfavorable Healthcare Laws: Healthcare is a major debate in state and federal elections. Every candidate campaigns on the promise of modifying the current system. The tax advantages of HSA accounts are critical for the continued success of HealthEquity. Any changes in regulations that impact the tax advantages to HSA accounts will be detrimental for HealthEquity. Other HSA custodians and banks: Quality customer service, competitive service fees, customer satisfaction and several other factors play a key role HealthEquity’s ability to acquire and retain customers. Competitors may offer better rates and provider incentives to switch HSA custodians. This could result in reduction in HealthEquity’s customer base. Health savings accounts allow consumers to contribute pre-tax dollars to a personal savings account that can be used to pay for certain medical expenses. 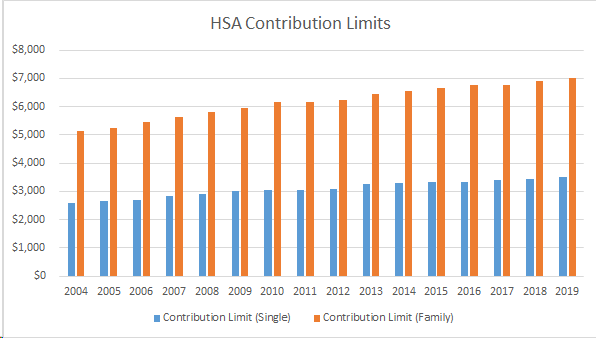 Since their inception in 2004, HSA contribution limits have increased to allow individuals and families to obtain tax incentives and encourage them to better plan their financial and healthcare needs. Triple tax advantage (contributions, earnings and gains are tax free). Most employers offer company contribution. No use-it-or-lose-it rule. HSA balance can be accumulated over years and can be passed on to a surviving spouse upon death of the account holder. For non-spouse beneficiaries, the account becomes taxable and can be inherited. HSA balance can be used today for qualified medical expenses in any country. Individuals do not have to wait until retirement to begin using their savings. A recent Devenir research states that there are 23 million HSA accounts today. They predict the growth to 29 million accounts by 2020 with 75 Billion in assets under management. In early 2018, America's Health Insurance Plans reported that enrollment in HSA-eligible healthcare plans increased by nearly 400% over a decade, from 4.5 million in 2007 to 21.8 million in 2017. Popular wealth management firms have seen tremendous growth in subscriber base for HSA in the past year. 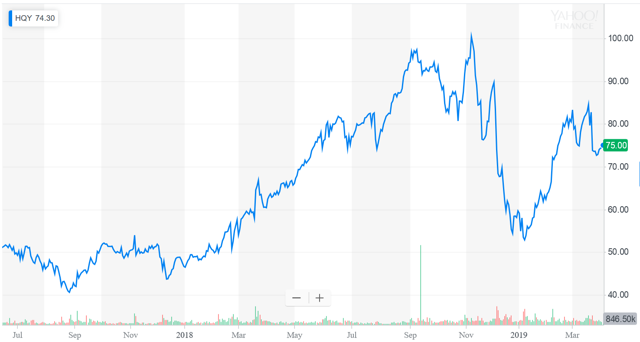 Fidelity’s recently-launched health savings account business is seeing double-digit growth, with assets in these accounts now topping $4 billion — a 50% increase from 2017. Fidelity now serves more than 1 million HSA account holders. The HSA story is quite popular among the millennial generation. A CNBC report says that 75% of millennials who are eligible for a HSA account already have enrolled into one. Recently, Amazon.com (AMZN) announced that they will accept HSA account debit cards as modes of payment for qualified medical expenses. Amazon also has a separate filter showing HSA/FSA eligible items, thereby making it easy for shoppers to understand which items come under qualified medical expenses. This move by the e-commerce giant’s move is expected to increase awareness and interest in HSAs. The HSA sector is poised to grow exponentially over the next decade. We believe HealthEquity is well positioned to be a leader in this segment and has demonstrated its ability to attract employers and customers. Analysis of the company’s sources of revenue indicate strong opportunities amidst risks. Recent events have caused the stock to pull back from its all time high. Management has reacted positively to these issues and is working toward remediation. I think HealthEquity stock is a good buying opportunity for investors with a 2-3 year investment horizon. Disclosure: I am/we are long HQY. I wrote this article myself, and it expresses my own opinions. I am not receiving compensation for it (other than from Seeking Alpha). I have no business relationship with any company whose stock is mentioned in this article.